Nike have a new ad campaign for 2012, the year of the London Olympics. 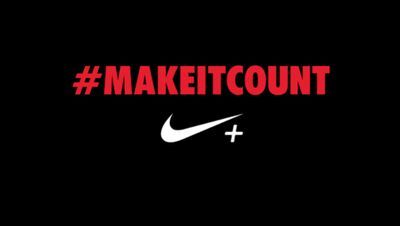 They’ve moved on from their slogan of ‘Just Do It’ to ‘Make it Count’. As creative people we’re often told to just do something: just write, just paint, just start moulding that piece of clay. Start moving and you’ll at least get somewhere. Sometimes that can be really good advice. Sometimes the only way to figure out what it is you want to write, to paint or to sculpt is to try something and discover that wasn’t it. But it’s easy to get sucked into always doing that, and to accepting the results of your creative attempt no matter what they come out like. I don’t think that’s good enough. It was hard to miss the pictures of Novak Djokovic after he won the Australian Open recently; they were all over the papers. Every muscle in his body proclaimed ‘I just did something that matters’ – and you can be sure that Nadal didn’t go away shrugging and saying ‘Well, at least he didn’t hurt me’! Just showing up, just doing something isn’t good enough for them. They are champions because they refuse to just have a go. They insist on giving their all every day, and if they lose, they go back out and give it their all again the next day. Just as they do if they win. We should not – must not – be satisfied with just having a go. Yes, whatever discipline we’re working in we will need time to warm up and practice, but there also has to come a time when we get on and do something that matters. Whatever your particular gift or talent, cherish it, nurture it and develop it. You can speak to the world in a way no-one else can. Through God’s empowering, you can make a transformation in our culture that is unique to you. Don’t just use your gift; make it count. This is an edited version of a post which first appeared on The Hope Creative. Might this passive attitude date back to 1854 when Tennyson, writing about the charge of the Light Brigade, penned the words ‘Theirs not to make reply, Theirs not to reason why, Theirs but to do and die’ ? In the course of time this has been changed to a shrug of the shoulders and a muttering of ‘ours is not to reason why’. It has become a British thing to underplay what we do; to keep the stiff upper lip; to decry our achievements. I suggest that, in addition to making our talents count, we also need to applaud and encourage others in their efforts to achieve. Nike might be making the gear, but it is not up to the Olympic athletes to done the shoes and shirts and excel on their own. It is for us to get beside them, making the noise of our combined voices count. Is there a direct correlation between modesty and complacency? Being modest about what we achieve is surely not a bad thing? But then, does that deny us a drive to succeed? I often converse with people over here about the American fervour for their country.I tell them we don’t sing the national anthem at every available opportunity or pledge allegiance to the Queen a dozen times a week because we’re British and thus we KNOW we were born in first place. We don’t have to shout about it or try and remind ourselves of it, as if it was possible to forget. We’re British. End of discussion. But does that negate a drive to succeed, do we on some level assume that we are going to win, simply because we’re British?